As the saying goes, “Use the right tool(s) for the job.” It’s commonsense advice that is often ignored. Imagine building a house without the right tools. More money and time is spent trying to get it right using the wrong tools, and the outcome is inferior. Ideas that stimulate creativity. I keep a folder filled with images of great graphics, slides, designs, layouts, and photographs for inspiration. Graphics that can be tailored for each presentation. Typically, I create and save my graphics in the presentation software to make customization fast and easy. Articles that explain, clarify, and educate. I save articles related to the topics I help present. At times, I need to pull content immediately, so it helps to have quick access to these pieces. I also keep how-to articles from past projects to save time if I forget the steps to create a unique graphic effect or animation, export slides into other software packages, or any other specialized task I don’t use often. Content tricks and tips. 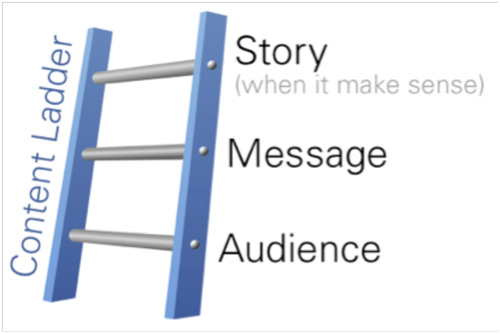 If a slide or presentation frequently changes, there is probably something wrong with the Content Ladder. We are either misunderstanding the audience, the message is unclear, or there is no story or flow. Design tips and tricks are tools and techniques that I use often to speed development. Rather than spend hours developing graphics, I go to Get My Graphic (http://www.getmygraphic.com) or similar websites to find PowerPoint graphics. These sites are fast, low-cost and I can reuse the graphics in future presentations. (Make a Graphic Asset Library from the graphics you download and those you create.) I also use a Graphic Cheat Sheet to help me pick the right graphics to communicate my ideas (http://www.billiondollargraphics.com/GraphicsCheatSheet_GMG.pdf). Editing tips and tricks allow me work fast. Most of my content remains editable in my presentation software. I use the software’s procedural features to fly through inevitable changes. For example, double-clicking on the “Format” paintbrush in PowerPoint holds the formatting of a selected object until you release it (e.g., by selecting “esc” and clicking another object to capture its style). 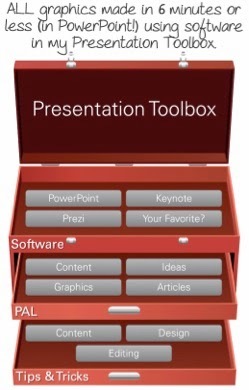 I suspect you have had some success integrating components of a Presentation Toolbox. My company and clients regularly see exponential improvements when building or buying new tools. Unfortunately, organizations may expect one solution to solve all challenges, which often results in inaction and no solution is implemented. Do not wait for the perfect solution. It does not exist. Instead, build or buy a solution that solves more than 50% of your challenges. Other processes, tools, or periodic updates can offset a solution’s deficiencies. 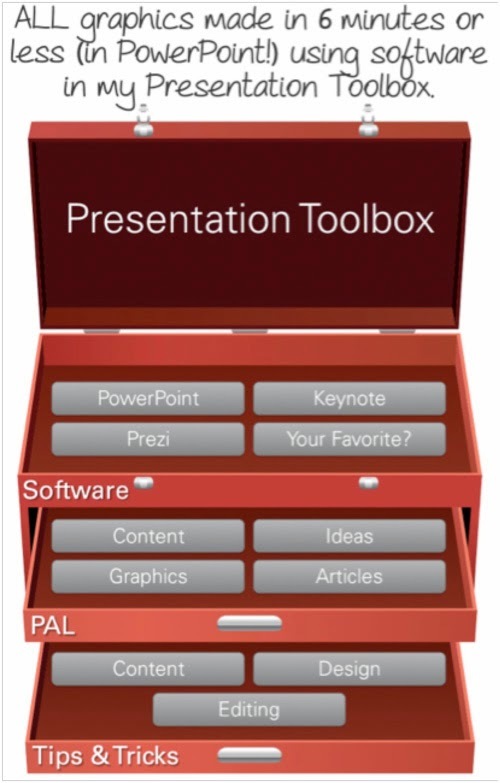 Make or expand your Presentation Toolbox today and stop losing time (and money) doing things the hard way with the wrong tools.